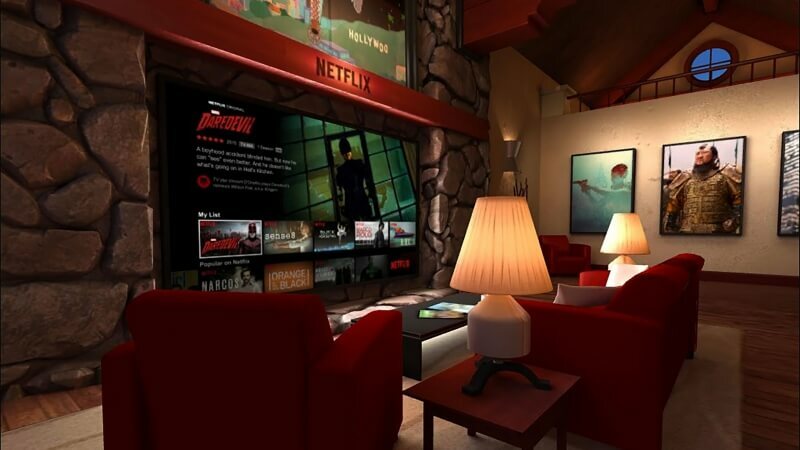 Right now, the best non-gaming virtual reality app available is arguably the one from Netflix. It puts you in a virtual living room, where you can watch movies and shows from the streaming site on a massive, wall-mounted TV. But despite creating this entertaining VR application, the company won’t be producing any original virtual reality content in the near future. The news comes from a Mashable France interview with Netflix co-founder and CEO Reed Hastings. "We're really focused on movies and TV shows and doing more of those, which you can watch in a virtual reality headset if you want to," he said, "but we think most people will watch Netflix on a smartphone or a smart TV." A company spokesperson confirmed to Mashable Australia that it wasn’t currently working on any virtual reality. But this isn’t to say that Netflix won’t start working on it at a later date. In the shorter-term, it looks as if Netflix will focus on other technology to improve its members’ experience. It was reported in February that the company is working on introducing data saving controls, second screen functionality and HDR content this year, backing up Hastings’ words that Netflix is concentrating on mobile devices and TVs before a possible move toward virtual reality. So while the idea of watching a Daredevil episode from within a digital representation of Nelson and Murdock’s office may sound pretty incredible, we’re going to be waiting a while before it becomes a (virtual) reality.